As Marine GeoGarage gives to the user the possibility to superimpose official raster charts from International Hydrographic Services upon Google aerial and satellite imagery, it could be interesting to report sights with major differences. Aerial and satellite Google images are regularly updated with accuracy improvements (see the Historical imagery tool in Google Earth), so the use of the Marine GeoGarage nautical chart opacity tool could become a basic technique for coastal change monitoring. Users who note a major difference between imagery and nautical chart can report us (contact@geogarage.com) the place using the network link at the bottom left side of the viewer. We will publish a specific page signaling the different reports (with reference to the user or in an anonymous way). Every month, the GeoGarage team will select the most significant report and will credit a month 'Premium Chart' for the winner. Aerial photographs are the primary source material used to create coastal survey maps. These data sets, in turn, provide information to Hydrographic Services for producing official nautical charts. Combining information from aerial photographs with hydrographic data helps to ensure that nautical charts are accurate. Nautical charts are one of the most fundamental tools available to mariners for planning voyages and navigating ships using the shortest, safest, and most economical routes. So it is obviously important that the information displayed on charts is correct. When international Hydrographic Services conduct hydrographic surveys, they used the best technology through stringent accuracy standards for the collection of data by their survey vessels. But of course only for the moment in time. Coastal waters are extremely dynamic. Natural shoaling occurs, earthquakes move sea beds, channels are dredged and new wrecks and obstructions are discovered. So the necessity for our web service to propose regular chart updates (which should match at term to the frequency of updates proposed by the different Hydrographic Services) and for the user to take into account the information promulgated through Local Notice to Mariners. Don't forget that for surveys performed prior to the mid 1990’s (so before standard DGPS), the accuracy requirement was only 1.5mm at the scale of the survey. On a 1:20,000-scale harbor approach survey, an accuracy of 1.5mm on the chart equates to 30 meters in real life. RNCs are made by scanning the paper chart printing materials. Any inaccuracies due to old methods of collecting, processing and displaying data on the paper chart were transferred to the RNCs. As a result, the accuracy of modern positioning systems such as GPS may exceed the positional accuracy of the RNC. The impact of positioning accuracies can be minimized by not zooming an RNC beyond the scale of the original chart. For example, while NOAA has accuracy standards for each step in the data collection and chart production process, much of the depth information found on official nautical charts is based on surveys conducted before 1940, the shoreline is more than 20 years old, and paper charts used to be compiled manually. The vertical aerial photographs used in Google Maps have been georeferenced to align with the coordinate system. The process of georeferencing involves identifying ground control points in the image for which accurate coordinates are available. A transformation is then calculated by computer software which processes the image so that it aligns to the ground coordinate system (Wolf and Dewitt, 2000). Mosaics are used to stitch many aerial photographs together. Controlled mosaics use rectified photos so that all of the photos are vertical and at the same scale. In mosaic assembly, image positions of common features in adjacent photos are matched as closely as possible. A plot of control points is used to match and constrain positions, similar to the technique used in georeferencing. Uncontrolled mosaics simply match the image details of adjacent photos without using the ground control, which is quicker but less accurate in terms of the coordinate reference system. Semicontrolled mosaics have either no ground control or use photos that have not been rectified. So Google Maps are certainly not to be considered a "gold standard" for accuracy as they provide a seamless worldwide imagery display. Google buys or licenses the imagery from different sources using different quality standards and referred to different datums, to stitch it all together to make up their product in an unique WGS84 datum. Scientists from NOAA and Texas A&M University-Corpus Christi were astounded to find that seamounts, mountains that rise from the seafloor, rank as some of the most common ocean habitats in the world. Their findings are published in a new study and reverse previous beliefs about the prevalence of seamounts, which are treasure troves of marine biodiversity. "Unlike beaches or even coral reefs, most people will never see a seamount, but this study shows that they are clearly one of the predominant ecosystems on the planet," said Peter Etnoyer, Ph.D., principal investigator of the study and marine biologist at NOAA's Center for Coastal Environmental Health and Biomolecular Research. "We can only hope that through this study, people begin to realize what a vast unknown the ocean represents, and what a vital role it plays on Earth." Although researchers have thoroughly explored some 200 seamounts and mapped and sampled a hundred others, this study is the first to estimate that more than 45,000 seamounts dot the ocean floor worldwide -- a total of roughly 28.8 million square kilometers or an area larger than the continent of South America. The discovery was made possible using satellite altimetry data that measured incredibly slight changes in the sea surface height that, along with statistical analysis models, indicated the presence of these submerged mountains. "Seamounts are biodiversity 'hotspots', with higher abundance and variety of life forms than the surrounding seafloor," said Tom Shirley, Ph.D., contributing author of the study and a conservation scientist with the Harte Research Institute at Texas A&M University-Corpus Christi. " In fact, new species are observed or collected on nearly every submersible dive." Two dozen new species of corals and sponges, for example, have been collected from seamounts in the Gulf of Alaska since 2002. Seamounts not only make up the largest area of ocean habitat, they are also highly productive environments that can serve as habitats for important commercial fish species like orange roughy and sablefish. This research, which is the first-ever comparison of the size of oceanic and land habitats, is featured in the journal Oceanography. Marine NZ displays all New Zealand nautical charts online from GeoGarage servers with the ability to use them offline with previously browsed tiles cache. Action to save the Baltic Sea is lagging far behind schedule, environmental group WWF said Wednesday, a day before regional ministers are to meet on the protection of the highly polluted sea in Moscow. "Efforts by coastal states to implement the common programme of action for the Baltic Sea are well behind schedule and schedules are being pushed further forward," WWF said in a statement, citing a monitoring report it commissioned from Gaia Consulting. Even simple measures, like replacing phosphates in detergents with other, harmless components to prevent the hazardous overconcentration of nutrients had been pushed back in most of the countries surrounding the Baltic, WWF said. Eutrophication, or the overconcentration of nutrients caused by sewage and agricultural run-off into the water, is seen as one of the biggest environmental problems for the shallow, semi-enclosed and brackish Baltic Sea. The environment ministers of countries surrounding it -- Russia, Finland, Sweden, Denmark, Germany, Poland, Lithuania, Latvia and Estonia -- are due to meet in Moscow on Thursday to discuss the current state of the ailing sea and efforts to restore its ecological status. In 2007, the countries committed to the Baltic Sea Action Plan of measures aimed at protecting and restoring it to good status by 2021, and in February regional leaders pledged action, but WWF said many of the efforts were delayed. "The strength and the idea of the Action Plan is that the same Baltic Sea protection measures are implemented in all coastal states simultaneously to generate a significant combined impact," Sampsa Vilhunen, head of WWF Finland's marine programme said in the statement. "However, it looks like the programme is being implemented in a fragmented way and action is marked by the principle of the lowest common denominator: when one party stalls, the whole effort is easily slowed down," he said. For example, while more than 10 percent of the Baltic Sea is already considered a marine protection area, the protected areas do not yet form a unified conservation network, according to the report. WWF said the time for rhetoric was over and urged ministers in Moscow to outline new, concrete actions to save the Baltic. 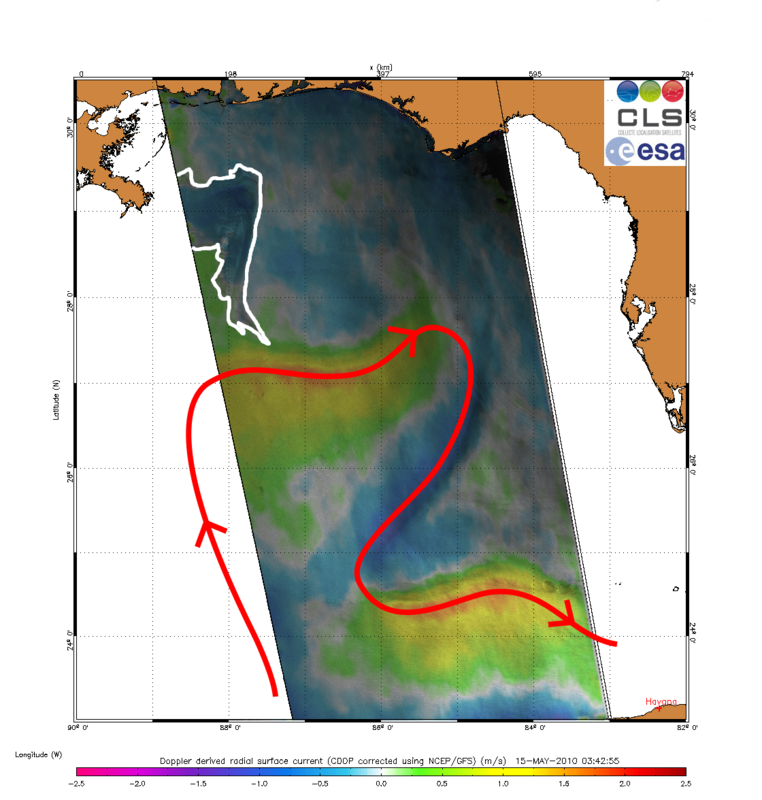 Scientists monitoring the US oil spill with ESA’s Envisat radar satellite say that it has entered the Loop Current, a powerful conveyor belt that flows clockwise around the Gulf of Mexico towards Florida. "With these images from space, we have visible proof that at least oil from the surface of the water has reached the current," said Dr Bertrand Chapron of Ifremer, the French Research Institute for Exploitation of the Sea. 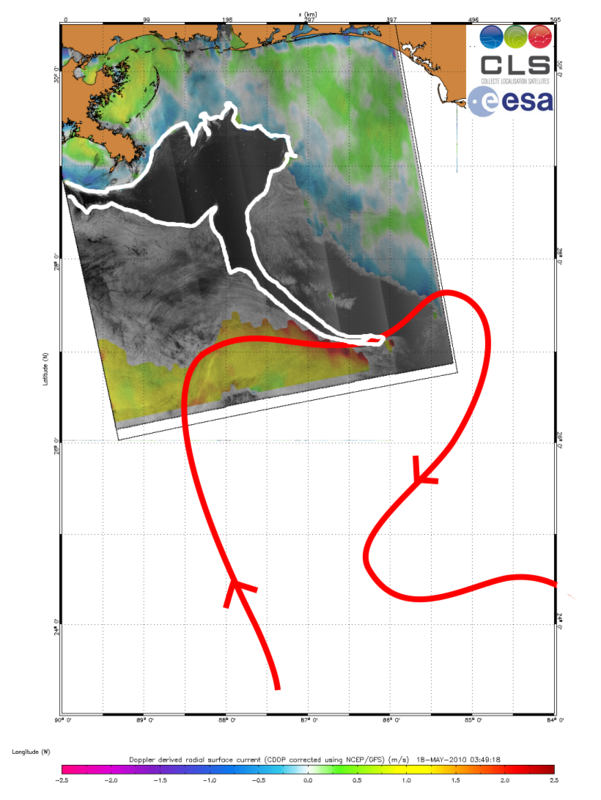 Dr Chapron and Dr Fabrice Collard of France's CLS have been combining surface roughness and current flow information with Envisat Advanced Synthetic Aperture Radar (ASAR) data of the area to monitor the proximity of the oil to the current. 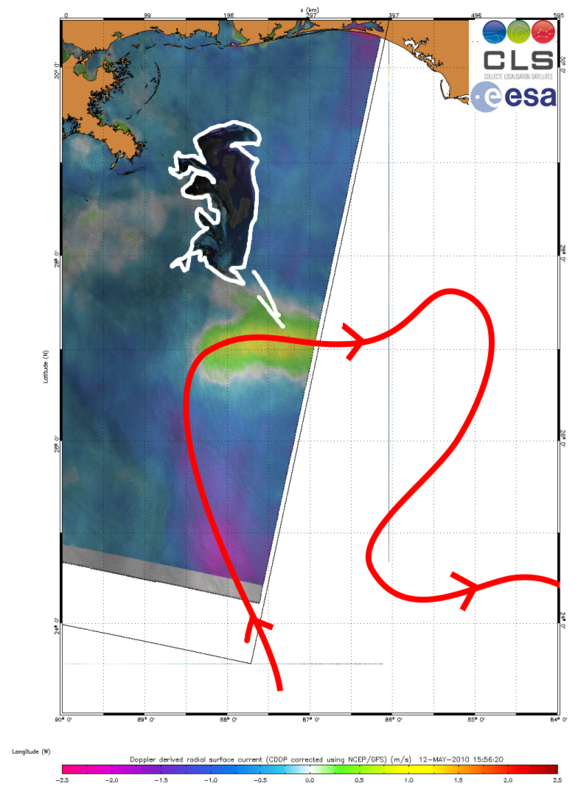 In the ASAR image above, acquired on 18 May, a long tendril of the oil spill (outlined in white) extends down into the Loop Current (red arrow). "We performed advanced processing methods on the images to display surface features like variations in roughness and velocity, which provides insight into the spatial structure of the spill and its transport by surface currents," Dr Collard explained. From the ASAR images of 12 May and 15 May, the oil spill was observed stretching increasingly closer to the Loop Current, raising concerns that it could reach the current and be carried south towards coral reefs in the Florida Keys. "Now that oil has entered the Loop Current, it is likely to reach Florida within six days," Dr Chapron said. "Since Envisat ASAR, ERS-2 and other SAR satellites are systematically planned to acquire data over the area, we will monitor the situation continuously." The scientists warn however that since the Loop Current is a very intense, deep ocean current, its turbulent waters will accelerate the mixing of the oil and water in the coming days. "This might remove the oil film on the surface and prevent us from tracking it with satellites, but the pollution is likely to affect the coral reef marine ecosystem," Dr Collard said. Combined efforts using satellite imagery and in-situ measurements of collected water samples will help to assess whether oil is in the deep waters of the ocean. The Loop Current joins the Gulf Stream — the northern hemisphere’s most important ocean-current system — sparking fears that oil could enter this system and be carried up to the US East Coast. Some 80 to 90 percent of undersea creatures make light -- from headlights on fish to incredible spiraling light shows on jellyfish, we know so very little about how or why it happens. Bioluminescence expert Edith Widder explores this glowing, sparkling, luminous world, sharing glorious images and insight into the unseen depths (and brights) of the ocean. Edith Widder spoke on the Mission Blue voyage in the Galapagos Islands about her passion – bioluminescence. Bioluminescence is the light chemically produced by many organisms found in the deep ocean. Not only is she is a specialist, but she has also helped design and invent new submersible instruments and equipment to study bioluminescence and enable unobtrusive observation of deep-sea environments. One of these instruments, the Eye in the Sea observatory, has produced footage of rare sharks, squid, and never-before-seen bioluminescent displays. In 2005 she founded the Ocean Research & Conservation Association (ORCA), which is dedicated to protecting aquatic ecosystems and the species they sustain through the development of innovative technologies and science-based conservation action. In an effort to protect and revitalize the ocean she loves she has been focusing on developing tools for finding and tracking pollution -- a major threat to all of our water ecosystems and ultimately to human health. Dr. Widder, who is also a winner of a MacArthur Fellowship “genius” 2006 award, received the prestigious invitation to give a TED talk due to her long track record of pioneering work in marine exploration and conservation. Ground tracks of 30 NAVSTAR GPS satellites. The time span covered by each ground track is five hours (time rate is 1000x real time). This month, the first Block IIF GPS satellite will launch from Cape Canaveral. It will be the fist of 12 new ones, which U.S. Air Force ordered at Boeing and this campaign is a part of the GPS Modernization Program. Boeing delivered also the 39 other SV's (Block I and Block II/IIA). The new GPS IIF features twice the navigational accuracy of the current satellites (advanced atomic clocks greatly improving performance and giving the control segment greater visibility into the health of the units) and should deliver more robust signals for aviation and SAR (probably also for Photogrammetry and Surveyors), meaning the new L5 signal. The new Block of SV's id designed for a 12 years life time period. Navstar GPS Block IIF will be the end of the current generation of GPS satellites. Actually, these new satellites each transmit three civilian GPS signals (we’ve typically been making do with just one for years) including a military-strength transmission that should enable autopilots to land with zero visibility. A three-signal world will mean always-on GPS that’s accurate to within 3 feet (even indoors and in concrete urban canyons). An official military announcement also laid out the 24+3 (“Expandable 24”) consisting to move three existing GPS satellites to new orbit locations will have a profound effect on GPS capabilities for all civil, commercial, and military users worldwide. In the future, the next-generation GPS system (Block IIIA) will introduce new capabilities to meet higher demands of military and civilian users. The system is looking ahead to its first launch in 2013. Block IIIA will offer the opportunity for a cross-linked command and control architecture, allowing the entire GPS constellation to be updated from a single ground station instead of waiting for each satellite to orbit into view of a ground antenna. Block IIIA will also support a new L1C civil signal, and a spot beam antenna that provides resistance to hostile jamming while improving its accuracy and integrity. Sea levels are rising everywhere, but in some areas they are rising quicker than others, bringing increased dangers of flooding. The altimetry project stretches back to 1992, and provides the global reference data for satellite-measured ocean surface topography. It is the Jason series and its predecessor, the Topex/Poseidon spacecraft, that have traced the recent 3mm per year rise in sea levels. The surface height information has been invaluable to oceanographers, weather forecasters and climatologists. On 2 February 2010 EUMETSAT announced that the Jason-3 ocean altimetry satellite Programme was approved by EUMETSAT Member States which will ensure a continuation for 2013-2014 of the series of measurements made by the Jason-2 satellite and its predecessors. Jason-2 provides a vital contribution to the monitoring of climate change, ocean circulation and weather and already supplies the data continuity that is essential for measuring the sea level trend, one of the key indicators of climate change. Jason-3 will continue the mission, ensuring thus the measurement of rising sea levels carried out by Jason-2, Jason-1 and TOPEX/Poseidon over the last 18 years. Big wave surfing is the extreme frontier of a fairly extreme sport. Big waves, or waves over 20 feet in height, add a whole new element to surfing that requires special boards, skills and methods of dropping into the wave. The rewards of surfing big waves are as big as the waves themselves, but with those big waves and thrills comes serious risks. Work up to big waves : when you're on the water, even a 10-foot wave seems like a giant. So getting to the point where you can (almost) fearlessly stare down a 20- or 30-foot wave takes lots of time on the water. Work your way up by surfing bigger and bigger breaks until you feel like you're ready to take the monsters of surfing. Get the right board : surfing big waves requires special skills and, just as importantly, a special board. Big wave boards, known as guns or rhino chasers, are longer, faster and more stable than most other boards. You need to find a board that is made for your height and weight and can also handle the size and speed of the waves you plan to surf. Tow in : towing in is a special technique for surfing big waves that involves high powered jet skis towing the surfers, on their boards, into the waves just before they start to break. Towing in is not a fun option but a physical necessity to surf big waves, so find someone who knows how to tow to train you how to get towed into a big wave. Mike Parson surfing Jaws, from the documentary "Billabong Odyssey"